Via di Ripetta, also called Via Ripetta, is an historic street in the historic centre of Rome (Italy), in the rione Campo Marzio, that links Piazza del Popolo to Via del Clementino and, with other toponyms (Via della Scrofa, Via della Dogana Vecchia), reaches the church of Sant'Ivo alla Sapienza, on the back of Piazza Sant'Eustachio and close to the Pantheon. 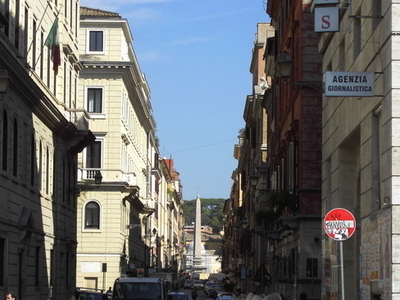 The Via is part of the complex of streets known as Tridente. The street boasts very ancient origins: in fact it retraces a former road map dating back to 1st century BC. At the beginning of the 16th century the street was adapted by Pope Leo X, from which it took the name of Via Leonina. The street took the present name in 1704, when the Porto di Ripetta was built: the river harbour was called ripetta ("little bank") in order to distinguish it from the Porto di Ripa Grande in Trastevere. Via di Ripetta is mentioned in the novel "The Late Mattia Pascal" by Luigi Pirandello, as a temporary residence of Adriano Meis / Mattia Pascal. Along the street, commemorative stones signal the birthplaces of Eleonora Fonseca Pimentel and of Angelo Brunetti (1800-1849), Italian patriot known as Ciceruacchio. Here's the our members favorite photos of "Famous Streets in Rome". Upload your photo of Via di Ripetta!